Permaculture, a term originated by Australian ecologists, Bill Mollison and David Holmgren, means permanent culture. Guided by ethical behavior, this methodology mimics the intelligence of nature, as modeled in indigenous cultures, to create productive human habitats. 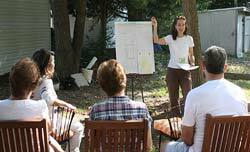 Patricia teaches Fundamentals of Permaculture, a 3 credit course, and can advise Independent Study students. 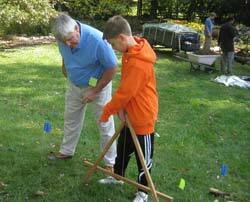 Most of these education programs include hands-on practicum. 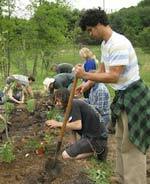 Permaculture Design fundamentals are explored through experiential learning. Programs can be tailored to complement school ciriculum. Edge - The junction/zone that lies between two media or landscape form; a border where materials or resources accumulate. Forest Garden – Mimicking the structure of a forest ecosystem for the purpose of maximizing small scale food production, a forest garden combines diverse trees and plants in beneficial relationships. This historic gardening method produces fruit, nuts, vegetables herbs and medicinal plants. Hugelkultur - A no-till garden bed and composting technique created by digging a trench and burying branches, and even logs, with the soil from the trench. The wood decays over a long period of time, steadily releasing nutrients and heat. The wood absorbs and retains rainwater, increases soil aeration, lengthens the growing season and sequesters carbon into the soil. Microclimate - The subtle variations in general climate conditions at a specific place as affected by local factors rather than regional ones; the localized climate around landscape features and structures. Suntrap - A relatively still, sun-facing area, sheltered from cold and /or destructive winds, which captures maximum sunlight all day. Swale - A small or large ditch dug along a contour to assist land in absorbing water. Thermal Mass – The ability of a material to absorb and store heat from the sun. Dense materials, such as brick, stone, earth and concrete, have the capacity to act as batteries, storing solar gain during the day and releasing the heat as indoor space cools as night.